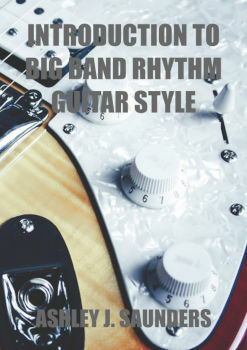 If you have ever wanted to join a big band, but didn't know where to start or what to play then Introduction to Big Band Rhythm Guitar Style eBook will enable you to find your swing! 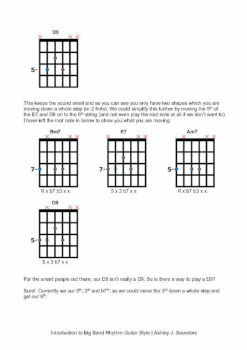 We'll cover commonly used guitar chords, basic rhythm ideas and so much more. Playing in a big band is great fun and a good challenge. However, there are a few key ideas you will want to master on guitar before you start playing the style. Introduction to Big Band Rhythm Guitar Style eBook will help to understand and apply the basics of this style. 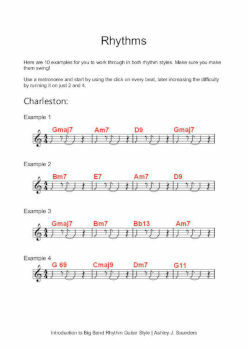 You will learn essential jazz guitar chords, which are used in the style. 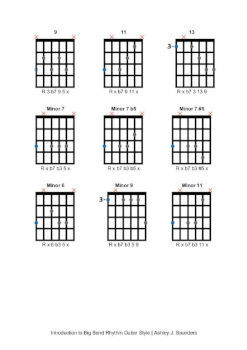 Which voicings to use and when to utilize them. We'll also talk about how to build jazz chords, so you'll never be short of ideas or options. I'll show you the main rhythm ideas used on guitar in the big band style as well as plenty of examples to get you practising and in the swing! So whether you're trying to expand your guitar playing or have a gig you need to prepare for, this eBook will guide you through the basics of this particular jazz style. So get into the swing, as there's no reason you shouldn't be able to! Playing in a big band is all about feel, therefore this eBook is aimed at those want to learn how to sounds the part!